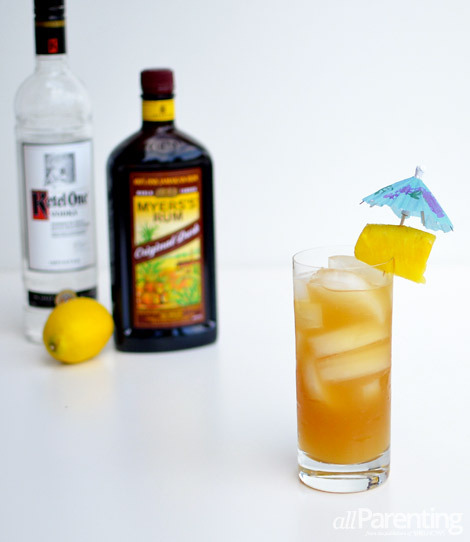 Enjoy the seduction of Myers's rum and vodka with a twisted Kalypso cocktail. The combination of rum and pineapple juice will have you dreaming of a warm tropical beach with your toes tucked into the sand. Sit back, relax and imagine sitting at a beach bar with a thatched roof enjoying the view of the ocean. In your hand, a delicious Kalypso cocktail with a juicy chunk of pineapple and an umbrella. Doesn't get much better than that, does it? The beauty of the Kalypso cocktail is the balance of the sweetness from the pineapple juice and the tanginess of the lemon juice. This combination, along with both vodka and Myers's dark rum, will have your taste buds screaming for just one more cocktail! Add Myers's rum, vodka, pineapple juice, lemon juice and simple syrup. Garnish with a pineapple chunk. Enjoy!